Did Jesus call Peter and Andrew at Bethany or at the Sea of Galilee? When we read the different disciple’s accounts of Jesus ministry, we run into details that seem to contradict each other. However, if we study the Scripture closely, we find that there is an internal consistency. I write this so that we may see that the Scripture is totally consistent and it’s perspicuity so apparent, that it can explain itself without much difficulty. In Matthew 4:18 Jesus was walking by the Sea of Galilee. Peter and Andrew immediately followed Christ when asked to. Some people think Jesus was at Capernum area which is west of the Jordan River (Matt 4:13), because He heard John the Baptist was imprisoned (Matthew 4:12). In John 1:28 Christ is hanging out in Bethany beyond the Jordan (not to be confused with the Bethany near Jerusalem). Further, Andrew (John 1:40) was walking with John the Baptist, walked past Jesus and decided to follow Him, Then, he immediately ran to his brother Peter (v. 41) and three days later they were at a wedding feast in Cana together (John 2:1). 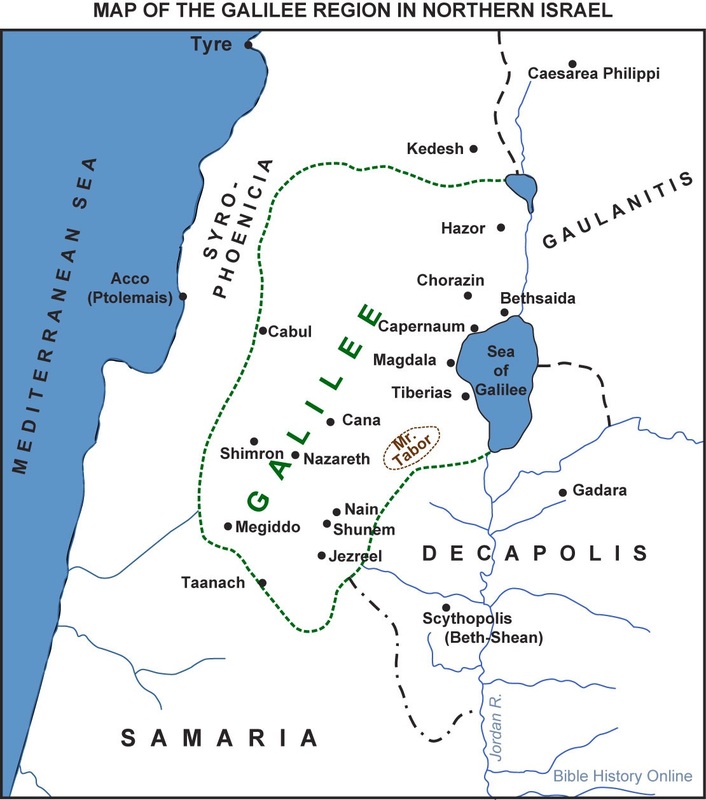 If Bethany beyond the Jordan was located on the north side of the Sea of Galilee near Bethsaida (the town where Philip, Andrew, and Peter were from), the geography and chronology can make sense. 1. “Jesus heard that John had been taken into custody” so he moved “into Galilee and leaving Nazareth, He came and settled in Capernaum” (Matthew 4:12-13). This area is roughly at the north end of the Sea of Galilee and the Jordan River. Hence, it is a few miles away from Bethany beyond the Jordan and it is realistic that Jesus could have easily traveled between one town and the next. 3. John the Baptist is approached by Pharisees who came to ask why he is baptizing to begin with (John 1:27). 4. The next day, John the Baptist recounts a time previous to that day in which he baptized Jesus (John 1:32). This means Christ was baptized some time before these events, which we know for a fact because in Matthew 4:1 Jesus was led into the wilderness and tempted by Satan. 5. The day after number 4, Andrew (John 1:40) was walking with John the Baptist, happened to pass Jesus and decided to speak to Him. Then, he immediately ran to his brother Peter (John 1:41) and told him about Jesus. They were likely about to go fishing at the time and Jesus came walking by at this moment. Andrew took his brother and introduced him to Jesus (John 1:42) and they left their net where it was to follow Him (Matthew 4:20). 6. The day after number 5, Jesus set out to go to Cana and picked up more disciples, including Philip, Nathaniel (John 1:43), John, and James (Matthew 4:21). 7. On the “third day,” which probably means one day after number 6, they were in Cana (John 2:1), which is about 30 miles away from where John was baptizing. If Jesus left at some time at the end of number 5, or the beginning of number 6, he likely traveled about 20-30 miles on foot. This is by no means an impossible distance, as someone can cover a mile in 20 minutes walking very slowly. So, it is at most a total of 10 hours of actual walking, likely with many breaks in between for water and rest. Now, we already know there are other episodes, such as Luke 5:1-11, but it is important to note the chronology that is presented. Jesus already met Simon Peter in Luke 4. So, when Jesus runs into Peter, James, and John fishing in Luke 5, it is possible that they followed Jesus for some time and then went back to their day jobs for a period, before going back with Jesus. After all, Peter addresses Jesus as “teacher,” which shows he already knew and esteemed Him. I find that I am very quick to start looking for inconsistencies in the Scripture or read too into things and see them there when they are not. It might be a weakness in my own heart and upon careful reading, there are some tough things to reconcile, but I believe we avoid a lot of these problems if we simply trust the Scripture and remember that “the sacred writings which are able to give you the wisdom that leads to salvation through faith” (2 Tim 3:15). So, in some ways, if I approach the Scripture expecting wisdom pertaining to science or secular history, I am not totally sure if the Scripture attests that it will fulfill this purpose for us. Obviously, when the Scripture does offer us chronology or name names, we are to go by these explicit references, but when it rattles off events in no particular order, such as the Book of Judges, it would be wrong for us to read the Scripture strictly as history and try to sequence all the events and make sense of all the numbers. Why? Because we would be reading the Scripture wrong. The Scripture was not made to answer our scientific and historical questions. Rather, it was made to lead us to salvation through faith in Jesus Christ. Next Next post: Does God predestine those who will choose Him?